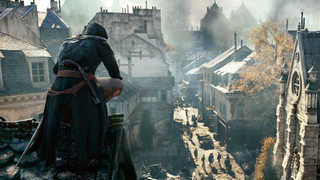 We've been seeing complaints all day about Assassin's Creed Unity's performance on consoles. Here's what we know from our own experience, and from what others are reporting around the internet. I've played a fair bit of the game on Xbox One, and have found the frame-rate to be a real bummer. To my eye, it generally seemed like it was hovering somewhere south of the 30fps that most gamers expect as a bare minimum, and frequently dropped well below that. When I'd play online on my otherwise stable internet connection, things were worse. I haven't played the PS4 version of the game, but unexpectedly, Eurogamer's Digital Foundry reports that it's actually worse than the Xbox One. That's unusual, given that the majority of console games perform slightly better on Sony's system. Regardless, it seems that no matter which console is attempting to run it, Assassin's Creed Unity is unable to run smoothly. Unity is the first graphically intensive third-party game this year to be developed for Xbox One and PS4, but not for Xbox 360 and PS3. (That is, it's the first big-budget game made by a platform-agnostic publisher, rather than designed exclusively for one console or the other.) The idea has been that by cutting the older systems loose, we'd get a game that could really show us what these new boxes could do. It's an exciting prospect! Unfortunately, this time we got a lesson in how even one of the the world's most well-staffed game development studios can still bite off more than they can chew. It's a shame, because for all its faults, Unity is often lovely-looking. It can feel, at times, like a terrific showcase for what these new consoles are capable of. (A+ kissing scene, Ubisoft!) But its technical stumbles are a reminder that any new hardware is going to suffer from some growing pains, and that we're probably going to get a few more lemons before game developers get their heads around these new machines. I'll admit that I'm more sensitive to this stuff than some—my boss Stephen, for example, doesn't really mind sub-optimal frame rates, and said as much in his Unity review. Over the last couple of years, I've become one of those people whose eye twitches every time the counter in the corner of a PC game ticks from "60" down to "59" and the game stutters for a split second. So, the constant frame rate fluctuations in Unity bug me more than most. Still, I sense that even a player who has no idea what frame-rates are would likely find Unity's performance lacking, even if they wouldn't be able to clearly articulate why. It's in the game's general feeling of weird disconnectedness, the way it never quite seems to be "listening" to you or responding to your button presses. Get in a sword fight in the comparatively solid Shadow of Mordor, and you can immediately feel the difference. One game is right there for you, and as a result you feel connected with it in a satisfying way. The other game is too busy crunching numbers to respond. There's no question that both the Xbox One and the PS4 can run amazing-looking games. Both the PS4's Infamous: Second Son and the Xbox One's Sunset Overdrive are open-world games that look brilliant and run smoothly. So, sure, Unity could be an anomaly. Given the host of other issues the game has, it does seem like the technical shortcomings I'm noting here are at least partly just expressions of a more generally troubled development. Still, it's disappointing to see one of the alleged standard-bearers for the new console generation stumble so badly out of the gate.